Applications: Designed to reach into the narrow joint between pipe sections when welding pipelines. They will give aggressive cleaning of the weld. They are also useful for cleaning other recessed welds and tracks due to their thin profile. For use on angle grinders. Product Notes: Just 6mm thick to give good reach in narrow recesses. M14 Mounting to fit directly to the spindles of standard angle grinders. High knot count for high performance and long life. Speed Rating: 115mm 13,000rpm. 175mm 9,000rpm. 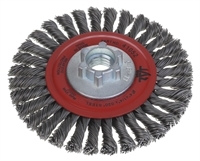 Also Available: We also stock narrow pipeline wire brush wheels in stainless steel wire.